.300 Winchester Short Magnum 180 Grain Swift Scirocco~ The principle at work in the short magnum cartridge is the advantage of fitting larger volumes of powder in closer proximity to the primer’s flash hole, resulting in more uniform, consistent ignition. The advantage to this round is the ballistics are nearly identical to the .300 Winchester Magnum, but in a lighter rifle with a shorter action. The .300 WSM is adequate for hunting moose, black bear, brown bear, elk, mule deer, and white-tailed deer in forests and plains where long range, flat shots are necessary. The .300 WSM is also used in benchrest shooting. 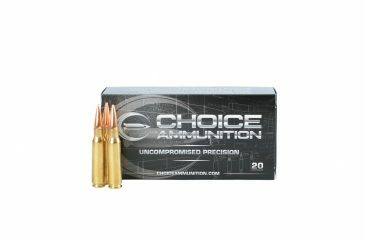 Choice Ammunition has taken our 100% hand-loading techniques and produce an extremely accurate, highly dependable round for the .300 Winchester Short Magnum in this load. Our loading tolerances are only matched by passionate hand-loaders in their own loading rooms. Consistent seating depths, powder charges and proprietary formulas of Choice Ammunition, make this 180 grain Nosler AccuBond round the best you can buy on the commercial market today. 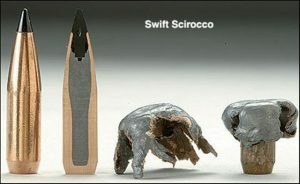 The Swift Scirocco bonded is the perfect bullet design for today’s fast, flat-shooting long range cartridges. Its secant ogive, 15 degree boat tail base and polymer tip create a sleek, aerodynamic profile that helps maintain down-range velocities and flat trajectories. The extra heavy tapering jacket wall with an internally bonded lead core provides structural integrity, reliable expansion and penetration with over 70% weight retention. These high-performance rounds provide excellent reliability, consistency, accuracy and stopping power for hunting most game. .300 Winchester Short Magnum 180 Grain Swift A-Frame~ The principle at work in the short magnum cartridge is the advantage of fitting larger volumes of powder in closer proximity to the primer’s flash hole, resulting in more uniform, consistent ignition. The advantage to this round is the ballistics are nearly identical to the .300 Winchester Magnum, but in a lighter rifle with a shorter action. The .300 WSM is adequate for hunting moose, black bear, brown bear, elk, mule deer, and white-tailed deer in forests and plains where long range, flat shots are necessary. The .300 WSM is also used in benchrest shooting. Choice Ammunition has taken our 100% hand-loading techniques and produce an extremely accurate, highly dependable round for the .300 Winchester Short Magnum in this load. Our loading tolerances are only matched by passionate hand-loaders in their own loading rooms. Consistent seating depths, powder charges and proprietary formulas of Choice Ammunition, make this 180 grain Swift A-Frame round the best you can buy on the commercial market today. For 28 years the Swift A-Frame rifle bullets have set the standard by which all bonded bullets are measured. With its controlled expansion of 2.2x and 95%+ weight retention A-Frame penetrates deep and mushrooms perfectly, making it the choice of hunters for use on any game, anywhere in the world. A-Frames are famous as a heavy game bullets in both North America and Africa. They have a spitzer or semi-spitzer shape. The A-Frame’s tapered copper jacket is divided into two sections by a traverse internal bulkhead, similar to a Nosler Partition bullet. The front half of the A-Frame has a lead core with a small exposed lead area flush with the tip of the jacket (what Speer would call a “mag-tip”) and mushrooms in the manner of a tough, bonded core, soft point bullet. The heavy partition amidships positively stops expansion at that point, keeping the rear half of the bullet, with its separate lead core, intact for deep penetration. The base of the jacket is folded over the back of the rear core to prevent it slipping. 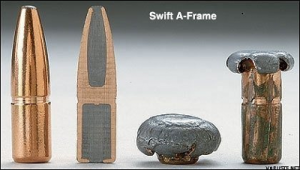 All A-Frames are flat base bullets and lead is exposed at both ends. Both cores are bonded to the jacket to prevent separation of jacket and core. The A-Frame’s exceptionally thick jacket and bonding of the lead cores to the jacket results in very high weight retention after impact, claimed to be around 95%. 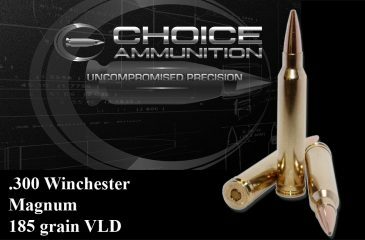 The A-Frame is a controlled expansion, lead core bullet with weight retention comparable to mono-metal bullets! .300 Winchester Short Magnum 185 Grain Berger VLD-H~ The principle at work in the short magnum cartridge is the advantage of fitting larger volumes of powder in closer proximity to the primer’s flash hole, resulting in more uniform, consistent ignition. 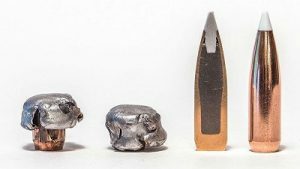 The advantage to this round is the ballistics are nearly identical to the .300 Winchester Magnum, but in a lighter rifle with a shorter action. The .300 WSM is adequate for hunting moose, black bear, brown bear, elk, mule deer, and white-tailed deer in forests and plains where long range, flat shots are necessary. The .300 WSM is also used in benchrest shooting. Choice Ammunition has taken our 100% hand-loading techniques and produce an extremely accurate, highly dependable round for the .300 Winchester Short Magnum in this load. Our loading tolerances are only matched by passionate hand-loaders in their own loading rooms. Consistent seating depths, powder charges and proprietary formulas of Choice Ammunition, make this 185 grain Berger VLD-Hunting round the best you can buy on the commercial market today. The Berger VLD design incorporates a sharp nose that allows the bullet to penetrate 2″ to 3″ before it starts to expand. After the initial expansion, the bullet will shed between 40% and 85% of its weight as shrapnel into the surrounding tissue (internal organs). The combination between the shrapnel and the hydrostatic shock produces a massive wound cavity within the vital area that will be 13″ – 15″ long. This massive wound cavity results in the animal dropping fast since most go into shock after such a tremendous blow. Those animals that don’t go down immediately will soon succumb to blood pressure loss and/or organ failure producing a quick ethical kill. .300 Winchester Short Magnum 165 Grain Hornady SST~ The principle at work in the short magnum cartridge is the advantage of fitting larger volumes of powder in closer proximity to the primer’s flash hole, resulting in more uniform, consistent ignition. The advantage to this round is the ballistics are nearly identical to the .300 Winchester Magnum, but in a lighter rifle with a shorter action. The .300 WSM is adequate for hunting moose, black bear, brown bear, elk, mule deer, and white-tailed deer in forests and plains where long range, flat shots are necessary. The .300 WSM is also used in benchrest shooting. 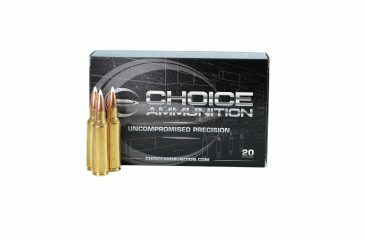 Choice Ammunition has taken our 100% hand-loading techniques and produce an extremely accurate, highly dependable round for the .300 Winchester Short Magnum in this load. Our loading tolerances are only matched by passionate hand-loaders in their own loading rooms. Consistent seating depths, powder charges and proprietary formulas of Choice Ammunition, make this 165 grain Hornady SST round the best you can buy on the commercial market today. Super Shock Tip Bullets combine proven Hornady performance with a higher ballistic coefficient than available with most hunting bullets. The sharp, pointed polymer tip creates a faster, flatter shooting bullet. With its one-piece core and jacket strengthened in critical areas, the SST delivers much more controlled expansion and superior weight retention than other tipped bullets. Featuring Hornady’s trade mark Interlock ring system, this bullet’s core and jacket remain locked solid during expansion, creating massive wound channels. .300 Winchester Short Magnum 165 Grain Nosler AccuBond~ The principle at work in the short magnum cartridge is the advantage of fitting larger volumes of powder in closer proximity to the primer’s flash hole, resulting in more uniform, consistent ignition. The advantage to this round is the ballistics are nearly identical to the .300 Winchester Magnum, but in a lighter rifle with a shorter action. The .300 WSM is adequate for hunting moose, black bear, brown bear, elk, mule deer, and white-tailed deer in forests and plains where long range, flat shots are necessary. The .300 WSM is also used in benchrest shooting. 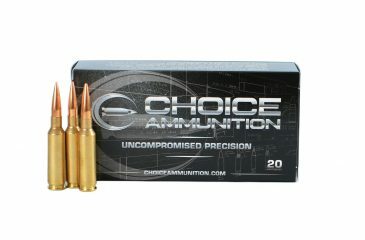 Choice Ammunition has taken our 100% hand-loading techniques and produce an extremely accurate, highly dependable round for the .300 Winchester Short Magnum in this load. Our loading tolerances are only matched by passionate hand-loaders in their own loading rooms. Consistent seating depths, powder charges and proprietary formulas of Choice Ammunition, make this 165 grain Nosler AccuBond round the best you can buy on the commercial market today. .300 Winchester Short Magnum 168 Grain Berger VLD-H~ The principle at work in the short magnum cartridge is the advantage of fitting larger volumes of powder in closer proximity to the primer’s flash hole, resulting in more uniform, consistent ignition. The advantage to this round is the ballistics are nearly identical to the .300 Winchester Magnum, but in a lighter rifle with a shorter action. The .300 WSM is adequate for hunting moose, black bear, brown bear, elk, mule deer, and white-tailed deer in forests and plains where long range, flat shots are necessary. The .300 WSM is also used in benchrest shooting. 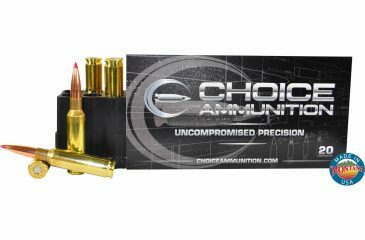 Choice Ammunition has taken our 100% hand-loading techniques and produce an extremely accurate, highly dependable round for the .300 Winchester Short Magnum in this load. Our loading tolerances are only matched by passionate hand-loaders in their own loading rooms. Consistent seating depths, powder charges and proprietary formulas of Choice Ammunition, make this 168 grain Berger VLD-Hunting round the best you can buy on the commercial market today. 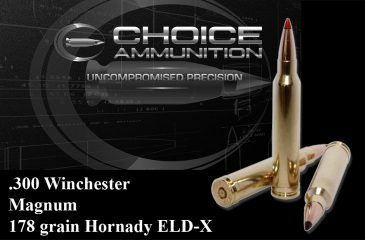 .300 Winchester Short Magnum 178 Grain Hornady ELD-X~ The principle at work in the short magnum cartridge is the advantage of fitting larger volumes of powder in closer proximity to the primer’s flash hole, resulting in more uniform, consistent ignition. The advantage to this round is the ballistics are nearly identical to the .300 Winchester Magnum, but in a lighter rifle with a shorter action. The .300 WSM is adequate for hunting moose, black bear, brown bear, elk, mule deer, and white-tailed deer in forests and plains where long range, flat shots are necessary. The .300 WSM is also used in benchrest shooting. 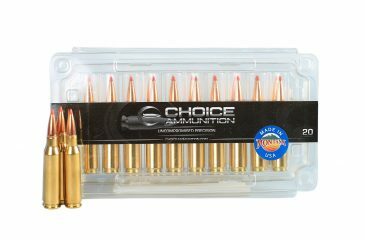 Choice Ammunition has taken our 100% hand-loading techniques and produce an extremely accurate, highly dependable round for the .300 Winchester Short Magnum in this load. Our loading tolerances are only matched by passionate hand-loaders in their own loading rooms. Consistent seating depths, powder charges and proprietary formulas of Choice Ammunition, make this 178 Hornady ELD-X round the best you can buy on the commercial market today. The Heat Shield tip of the Hornady ELD-X bullet defies the effects of aerodynamic heating and retains its shape to provide a perfect meplat (tip) that is always the same shape. A streamlined secant ogive with optimum boattail design, plus the highly concentric AMP bullet jackets, combined with the patent pending Heat Shield tip creates a supremely accurate, high BC match bullet. ELD-Match bullet BCs are measured with Doppler radar and corrected to standard atmospheric conditions. With high velocity, 0-400 yard impact, the bullet continually expands throughout its penetration path. The thick shank of the jacket and high Interlock ring keep the core and jacket together providing 50-60% weight retention. Upon low velocity, 400+ yard impacts, the Heat Shield tip drives backward into the bullet to initiate expansion. 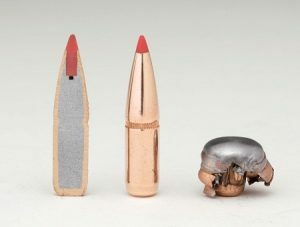 Exhibiting conventional expansion with a large mushroom and 85-90% retained weight the bullet provides deep penetration and large wound cavities. .300 Winchester Short Magnum 180 Grain Nosler AccuBond~ The principle at work in the short magnum cartridge is the advantage of fitting larger volumes of powder in closer proximity to the primer’s flash hole, resulting in more uniform, consistent ignition. The advantage to this round is the ballistics are nearly identical to the .300 Winchester Magnum, but in a lighter rifle with a shorter action. The .300 WSM is adequate for hunting moose, black bear, brown bear, elk, mule deer, and white-tailed deer in forests and plains where long range, flat shots are necessary. The .300 WSM is also used in benchrest shooting. 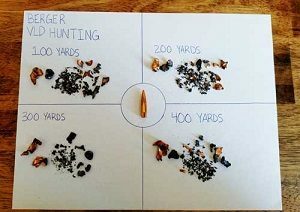 .300 Winchester Short Magnum 200 Grain Nosler AccuBond~ The principle at work in the short magnum cartridge is the advantage of fitting larger volumes of powder in closer proximity to the primer’s flash hole, resulting in more uniform, consistent ignition. The advantage to this round is the ballistics are nearly identical to the .300 Winchester Magnum, but in a lighter rifle with a shorter action. The .300 WSM is adequate for hunting moose, black bear, brown bear, elk, mule deer, and white-tailed deer in forests and plains where long range, flat shots are necessary. The .300 WSM is also used in benchrest shooting. Our 100% Hand-Loaded 200 grain Nosler AccuBond rounds are loaded with extremely tight tolerances, producing highly accurate, consistent and reliable performance with each and every shot! Our proprietary load formulas and loading process create the finest round of ammunition available on the commercial market today we feel. If you don’t load your own ammunition- let us do it for you! .300 Winchester Short Magnum 210 grain Berger VLD-Hunting~ The principle at work in the short magnum cartridge is the advantage of fitting larger volumes of powder in closer proximity to the primer’s flash hole, resulting in more uniform, consistent ignition. The advantage to this round is the ballistics are nearly identical to the .300 Winchester Magnum, but in a lighter rifle with a shorter action. The .300 WSM is adequate for hunting moose, black bear, brown bear, elk, mule deer, and white-tailed deer in forests and plains where long range, flat shots are necessary. The .300 WSM is also used in benchrest shooting. 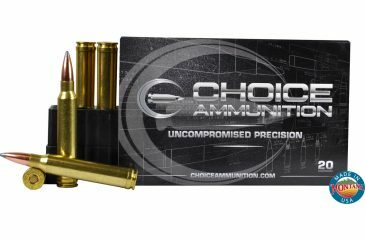 Choice Ammunition has taken our 100% hand-loading techniques and produce an extremely accurate, highly dependable round for the .300 Winchester Short Magnum in this load. Our loading tolerances are only matched by passionate hand-loaders in their own loading rooms. Consistent seating depths, powder charges and proprietary formulas of Choice Ammunition, make this 210 grain Berger VLD-Hunting round the best you can buy on the commercial market today. .300 Winchester Short Magnum 150 Grain Hornady SST~ The principle at work in the short magnum cartridge is the advantage of fitting larger volumes of powder in closer proximity to the primer’s flash hole, resulting in more uniform, consistent ignition. The advantage to this round is the ballistics are nearly identical to the .300 Winchester Magnum, but in a lighter rifle with a shorter action. The .300 WSM is adequate for hunting moose, black bear, brown bear, elk, mule deer, and white-tailed deer in forests and plains where long range, flat shots are necessary. The .300 WSM is also used in benchrest shooting. 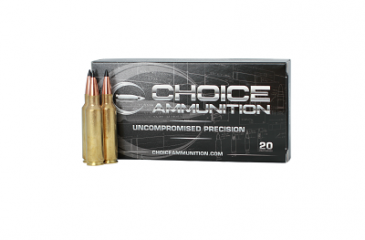 Choice Ammunition has taken our 100% hand-loading techniques and produce an extremely accurate, highly dependable round for the .300 Winchester Short Magnum in this load. Our loading tolerances are only matched by passionate hand-loaders in their own loading rooms. Consistent seating depths, powder charges and proprietary formulas of Choice Ammunition, make this 150 grain Hornady SST round the best you can buy on the commercial market today. The Hornady SST (Super Shock Tip) is designed to deliver tremendous shock on impact while expanding quickly and reliably, particularly at higher velocities. .300 Winchester Short Magnum 150 Grain Nosler AccuBond~ The principle at work in the short magnum cartridge is the advantage of fitting larger volumes of powder in closer proximity to the primer’s flash hole, resulting in more uniform, consistent ignition. The advantage to this round is the ballistics are nearly identical to the .300 Winchester Magnum, but in a lighter rifle with a shorter action. The .300 WSM is adequate for hunting moose, black bear, brown bear, elk, mule deer, and white-tailed deer in forests and plains where long range, flat shots are necessary. The .300 WSM is also used in benchrest shooting. Choice Ammunition has taken our 100% hand-loading techniques and produce an extremely accurate, highly dependable round for the .300 Winchester Short Magnum in this load. Our loading tolerances are only matched by passionate hand-loaders in their own loading rooms. Consistent seating depths, powder charges and proprietary formulas of Choice Ammunition, make this 150 grain Nosler AccuBond round the best you can buy on the commercial market today.